I had a nice time watching this Jackdaw run around the garden. He explored the place, picking up what looked like paper and was chucking it around. 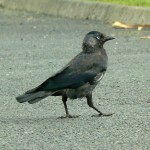 This entry was posted in Birds and tagged Bird, Jackdaw on January 19, 2010 by admin.